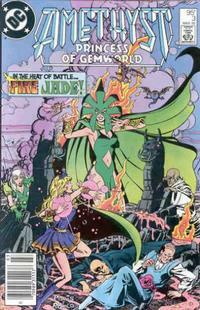 The cover for this issue proclaims “In the heat of battle….FIRE JADE!” Fire Jade is standing triumphantly on top of a volcano. Amethyst is summoning up some magic to fight her. Princess Emerald seems to be hiding behind some rocks, biting her glove. Lord Moonstone is looking rather disheveled and the Diamond Priest is taking a rest by leaning against a demonic statue. Rivulets of lava flow around everyone. The title of this issue is “Rebellion!” There’s plenty of fighting and Prince Topaz shows himself to be a psychopathic playa. Lord Aquamarine’s bird has mysteriously changed from black to white since the last issue. He nears his home and swears “By the celestial orb! What madness has transpired in my absence! ?” He sees all of his royal guard lying on the ground dead. The fisher folk confront him saying that they’ll bar him from his seat of power. Quaar says that Lord Aquamarine’s brutal reign is at an end, clutching the magic sword that Fire Jade gave him. Lord Aquamarine thinks it is funny the rebels are talking to him about brutality when his guards were slain by fire. He doesn’t really care because he can reanimate their corpses and start the fight again! Quaar is surprised, he thought that the fire was going to fend off the guards not kill them. Lord Aquamarine attacks with magic saying “You haven’t the stomach for this, fisherman!” I will not honor you by taking sword in hand to end your worthless life!” Quaar manages to deflect Lord Aquamarine’s magic with his sword. He thinks about Old Yuhr and Fire Jade putting their faith in him, and he throws his sword at Lord Aquamarine’s heart. Amethyst is having a temper tantrum. She’s yelling at Lord Garnet to leave her alone, saying that if the Gemworld is coming to an end she’s not going to go with it. Lord Garnet pins Amethyst’s arms behind her back, saying that he can’t allow her to try to cross over to Earth. Emerald reminds her about the dangers that lurk between the worlds. Amethyst says that she hasn’t forgotten, but somehow she got to the Gemworld again without even trying. She wanted to see everyone again, but not like this. She wants to go home. 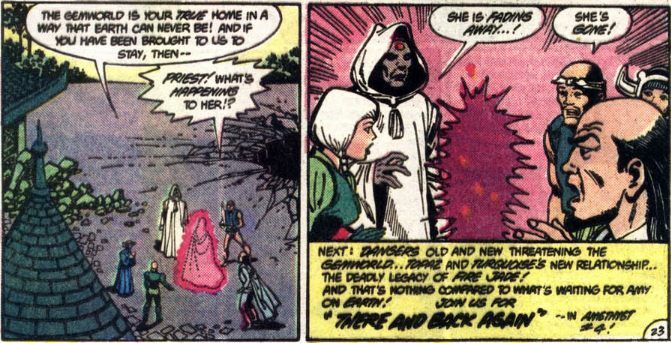 The diamond priest starts telling her not to despair and interrupts himself to yell “Demons of the Dark! My Lords and princesses and can but tell you what I read upon the mystic plane of knowledge…that Lord Aquamarine is dead!” Princess Emerald is shocked that the person who saved her life is dead. Lord Moonstone decides that they must go smite the ones who murdered him. Lord Garnet says no. Amethyst wonders why, when Aquamarine was their ally against Dark Opal. Lord Garnet says “We owe him nothing! Whatever fate the sea lord met he likely did deserve. He was a vile and self-serving and ambitious man. And that ambition took the lives of many around him, including my only son!” Amethyst is shocked. Moonstone says that Aquamarine will be avenged with or without Garnet’s help. Prince Topaz is hanging out with Lady Turquoise on the barrier islands near Topaz keep. The barrier islands are evidently the equivalent of a swinging bachelor pad on the Gemworld, because this is where Topaz’s father wooed his mother. Lady Turquoise tells Topaz to not think of Amethyst and think only of her. Topaz says that what he felt for Amethyst was only infatuation. His true love is Turquoise. His eyes look blank. He reaches for a dagger to kill Turquoise. 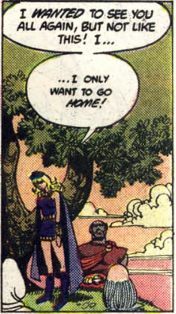 Quaar recognizes Amethyst, and remembers that she saved the world. But if she’s attacking because they slew Lord Aquamarine she must be their enemy too. Quaar’s sword deflects one of Amethyst’s blasts of energy and it hits the Diamond Priest. 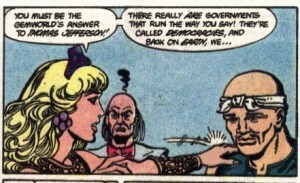 Lord Moonstone points out that Fire Jade must be the leader of the rebellion. Princess Emerald causes the earth to swallow up Fire Jade. 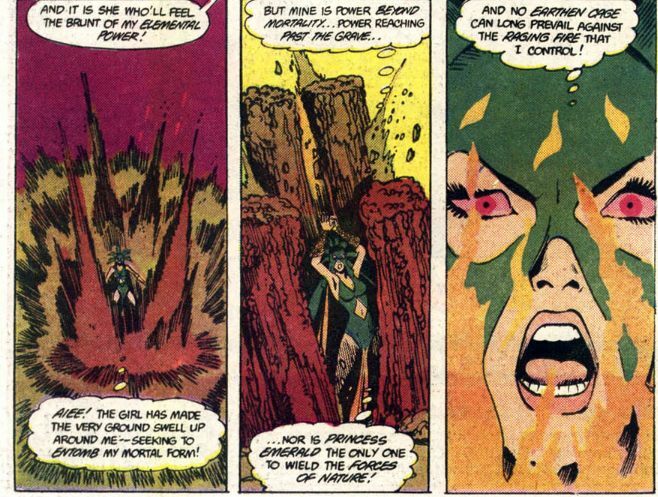 Fire Jade thinks that her power is “beyond mortality, power reaching beyond the grave…nor is Princess Emerald the only one to wirld the forces of nature!” Hmmm, who could Fire Jade be? Flames engulf Fire Jade and she vanishes, but not before using her powers to conjure up some creepy golems with flaming heads. Fire Jade has retreated to her lair. She thinks that she wasn’t expecting the other nobles to respond so quickly. She’s planned for their deaths for so long, but there’s one among them that she wishes could be spared. Hmmmmmmm. Poor 14 year old Tom who asked Amy to the dance is driving by Amy’s house with his dad on the way to their bakery. They are surprised that all the lights are on at the Winston place and wonder what’s going on. Emmy watches over Mr. and Mrs. Winston. They’re sleeping in Amy’s room. Amy is still asleep, surrounded by a purple magic glow. Lord Moonstone tosses Amethyst a sword and she lets loose, cutting off the firey heads of the golems and returning them to their original inanimate form of piles of mud. She grows angrier in battle and starts to destroy the fisherfolks’ weapons with her sword. Lord Diamond stops her just as she was about to drive the rebels into the flames. She doesn’t know what came over her. Lady Aquamarine’s gown has caught on fire due to some fire imps, and she can’t put out the flames with her water powers. 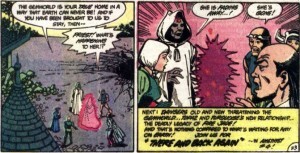 Quaar grabs Lord Moonstone’s sword saying “Out of my way, you royal fool!” He runs towards Lady Aquamarine, and slices off the corner of her gown before the whole garment catches fire. Quaar’s back starts to singe from more fire imps and Amethyst runs to help him. She thinks they might be on the same side. Topaz looks down at a sleeping Turquoise. He thinks that he could love her if Fire Jade hadn’t revealed to him the treachery in Turquoise’s heart. Turquoise wakes up briefly and Topaz tells her to go back to sleep. He reaches for his knife again. For an assassin, Topaz is rather ineffectual. I think he’s had more than enough time to knife Turquoise. Fire Jade says that the magic of the Gemworld won’t help the nobles now because it is in disarray due to Aquamarine’s death and Princess Emerald’s interrupted investiture ceremony. 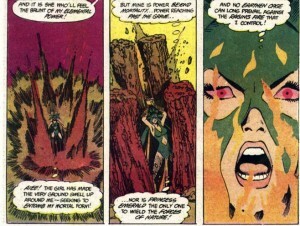 Emerald focuses her powers and blasts Fire Jade. Fire Jade blasts back at Emerald, yet curiously Emerald survives. Amethyst and Quaar go after Fire Jade; Amethyst with a tornado and Quaar with his sword. 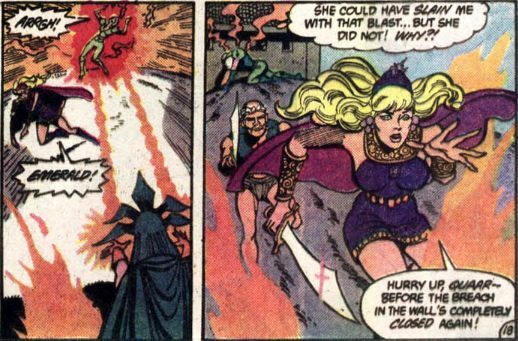 Quaar stabs Fire Jade and she falls backwards into the volcano. Topaz realizes that he’s not acting like himself and throws his dagger in the lake. But he still loves Turquoise! Amethyst assumes that Lady Aquamarine will take over her kingdom. Quaar objects, saying that even though they might have been Fire Jade’s pawns their grievances against Aquamarine were real. Lady Aquamarine confirms that her husband was a power hungry despot. Quaar proposes that Aquamarine be ruled by the people. Amethyst thinks he’s the Gemworld’s Thomas Jefferson, and starts laying down some knowledge about democracy from her high school civics class. The Diamond Priest tells Amy that there are events happening that no one can fully understand. The Gemworld is her true home in a way that the Earth can never be. Amethyst suddenly fades away! This entry was posted in comics and tagged Amethyst Princess of Gemworld on 9/29/2008 by Anna.